The Youyue Li-Ning 10K Running League of 2016 (hereinafter known as the "10K" ) kick-off in Haixinsha Park, Tianhe District, Guangzhou and the runners were off with the pistol. As the "Best Road Race Tournament in China", Li-Ning 10K has been striving to create quality and professional racing experience. It offered professional solutions on running, which integrated products, services and race experience, to runners. Meanwhile, the 2016 Li-Ning 10K Online League was also put into operation. Even more running fans might opt to experience the 10K fun through their own track. Fans' passions were lighted up with the presence of Dwyane Wade at Raffles City. Having received the Way of Wade catalogue prepared by the loyal fans, in the countdown of crowd, Wade pressed the Roman V-shaped device on the stage and declared the official launch of Li-Ning's Way of Wade 5 with his game brand shoes presented on site. "Unlike other companies, Li Ning Company has its unique history comprising my personal experience on sport training, every competition that I had participated in, and also how I comprehended the connotation and spirit of sports. I wish to carry forward the DNA of sport as a heritage through corporate and commercial acts. I wish to promote the spirit of sport through our operations. That's why I founded the Company and named it so," Li Ning mentioned in the exclusive interview. Li Ning 26th anniversary carnival "'Li' keeps us together!" Li Ning Company announced to partner with Danskin, the professional dance and sport brand of the U.S.A. of 134 years' history, to launch in phases fashionable fitness products of professional dance and yoga catering for the Chinese women consumer groups. Aiming to stimulate people's aspirations and efforts to make breakthrough by means of sports, we endeavor to push forward the evolution of professional sport products from commoditized product to "Smart with Quality" product". We change our life-styles with sport and seek further breakthroughs. The Company will also introduce the core concepts, such as "Dreams Come True", "Consumer-oriented" and "Breakthroughs", to our efforts of developing into the world's leading sport product company. Starting from 2012, LI-NING China 10K Road Racing League, serving as the first league up to professional standard and an iconic road racing competition in China, has been named the "Best Running Tournament Award in China" by Runner's World, a professional and authoritative magazine for runners in China, for the last two years in a row. As of 2015, over 150,000 runners directly experienced "the best road racing competition in China". Besides the offline road racing league, LI-NING worked with Xiaomi sports APP to roll out an online 10K Road Racing League. Breaking the boundaries of competition is gaining endorsement and popularity among runners. The China International Trade Fair for Apparel Fabrics and Accessories – Spring Edition was held in Shanghai (Intertextile Shanghai Apparel Fabrics). LI-NING was the only domestic sporting goods brand invited to the fair. LI-NING manifested its achievements in terms of environmental protection and sustainable eco-friendly development by displaying its organic cotton and Eco-circle sports suit series in the sustainable development attire exhibition zone. Riding on the development and use of new environmentally-friendly materials, LI-NING brand has set the trend for sustainable design development in the industry through practical environmental protection concepts, making life greener with technology. During the exclusive interview given by finance.ifeng.com, Mr. Li Ning expressed, "I am still working hard to be a sports brand of China. I hope of making contribution to cities and society by making use of my experience gained in sports." He concluded the interview with the motto "Anything is possible." Staging a debut in Houhai, Beijing, the journey of Wade China Tour began with the announcement of the winner of "The Global Wade-of-Way design competition" in the Li-Ning Centre. The laureate was named Chameleon, which is the first product incorporating the design concept submitted by a netizen and put into mass production and sales. This move was a solid step for realizing "Internet+"strategy. Deeper interaction between the Company and basketball devotees and customers with the theme of Chameleon and local features were unveiled in Shijiazhuang, Chengdu, Dongguan, Shenzhen and Guangzhou, further enhancing the consumer and product experiences. LI-NING partnered with Huami Inc. to proactively introduce a new and interesting smart running lifestyle, to inspire and enrich the mass sports participants with professional smart products and services The two smart products deeply researched and developed on top of LI-NING SMART and Xiaomi Sports Cloud Big Data Technology Platform. As a result, the smart platforms are the hybrid of "Professional Equipment +Smart hardware +mobile internet +data Analysis and sharing" which furnishes customers with the wideranging running experience and carves out a new era of "Internet + Sports Life Experience" for LI-NING brands. Li-NING is stepping into a new era after 25 years, and reactivating the motto "Anything is possible" to renew its brand with new life. "Anything is possible"is the DNA of LI-NING brand, which moves along with the trend and signifies the strategy of shifting from a sports equipment provider to an "Internet +Sports Life Experience" company. During the 25th anniversary ceremony, Mr. Li Ning gave his remark, "Down through 25 years, we always keep our original course and embraced everyday challenges with bold innovation and breakthroughs. With the arrival of the 25th years, Li Ning Company stepped into a new era of business development. It is hoped that we can re-establish our mission and core values and realize the motto "anything is possible", that is, to have a passion for sports and pursue our dreams with boundless imaginative power. Not only is "anything is possible" our DNA, but it also manifests our brand spirit. "Internet+" is an overwhelming trend that requires us to be more adaptable to the internet environment and lifting ourselves from the bottleneck to the breakthrough with full imagination and bold innovation to reinvigorate the Company." The overall sales of LI-NING brand during "Double 11" hitover RMB200 million on TMall, staying as the top of domestic sportswear brand. As the strategic partner of CBA League Tournaments,Mr. Li Ning delivered his blessings for the start of new season at the end of the awards ceremony, " It is hoped that the players can play an all-out opening match tonight. Anything is possible for the new season." The thrill of CBA League Tournaments is not only limited to the adrenaline pumping matches but also lies in the annual spectacular jamboree that gathers fans together, in which sports equipment, basketball spinoff products and positive dynamics in the competition are enriching CBA League Tournaments' basketball culture . In this season, Li Ning Company will further promote the basketball culture by continuing the well-received indoor and outdoor activities and rendering "My Sports Suit", customized service, while further unleashing the glamor of basketball. LI-NING has entered into strategic cooperation with JD to further improve inventory management and lower overall operating expense. With such cooperation , the demand of the goods in LI-NING stores was satisfied in time, which helps to realize the connection of online to offline in terms of inventories, sales, services and users. This more efficient supply chain system should further enhance retail sales channel, which laid a solid foundation of supply chain for Li Ning Company's O2O strategy in place. According to the latest WTA ranking, Peng Shuai has topped the world ranking in women's doubles, the best world tennis ranking for China in history. Li Ning's top performance tennis shoes for women, "Clover", time and again powered Peng Shuai to her successes. The shoes are covered with gradient camouflage and clover, symbolising good luck, in a heart shape pattern, a pattern that she loves the most. As a personal symbolic pattern, the heart shape pattern represents the steadfastness, perseverance, and tireless efforts of Peng. The two sides of the shoes have her motto "Never ever give up" printed on them, demonstrating the unremitting staunchness of Peng Shuai. The eco-friendly shoes Green in Black made from recycled waste tires have won Li Ning Company a Germany iF Design Award, an honour well-received as the "Oscars of Designs". The Green in Black has also been shortlisted as a finalist by Industrial Design Excellence Awards in the US. Through a series of activities with the excitement of competition blended with the fun of sports games which attracted young basketball players to have an "Instant game" held in nine stops, including Changsha, Zibo, Kunming, Taiyuan, Shenyang, Xuzhou and Beijing, from the kick-off of the CBA All-Star Games in January 2014 until June, LI-NING brand products with more professional basketball attributes were introduced into campuses using resources deployed by Li Ning for campus basketball leagues. In the half-year period between March and September, contestants "run" through ten cities where the running league was held: Shenzhen, Chongqing, Xi'an, Changsha, Wuhan, Shanghai, Qingdao, Shenyang, Dalian and Beijing. 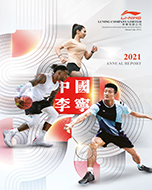 The contests held in the previous three years have exemplified the emphasis that Li Ning has placed on the development of running both as a sport and as a culture in China, as well as its focus on the needs of mass runners in society. Highlights of the attention-getting first Runner's World Awards Ceremony 2013-2014 were published in the Chinese version of Runner's World, the world's leading runners' magazine. Among all the awards, the "2013 Best Running Tournament Award" was presented to LI-NING China 10K Road Racing League. For prizes in the running equipment category, Li Ning's Super Light 11 running shoes claimed the "Best Upgrade Award" in the running shoes category for 2014 spring. Apart from continuing with the innovative 3V3 and time trial forms in the fifth 3V3 contest of Li Yongbo Cup, Li Ning Company provided badminton fans with professional equipment used in top international contests. Title and equipment sponsorship of the tournament and performance of endorsed players in the tournament enabled the brand to have exposure both on the spot and through television broadcasting. Marin Cilic has long been known as the Little Croatian Giant. His tournament shoes adopted "The lighter, the faster!" as the core design concept. This model of men's professional tennis tournament shoes, Court Racer Pro, has become another model of professional tennis shoes after Pro Competition. The 17th CUBA League was unveiled at Shanghai Jiaotong University, the slogan of the new season being "Play free" to encourage students to display their talent and release their passion in the stadium so as to enjoy the genuine fun of basketball. Covering a direct mass of over 2 million, the CUBA League for this season attracted more than 24,000 players from 1,200 teams in 800 tertiary institutions from 33 zones in China. LI-NING Super Light 11 running shoes won the gold award in the sports apparel product design division in the 2014 ROI Festival. To celebrate the 20th anniversary of the CBA League, Li Ning Company Limited especially made replicas of the most representative classic sportswear in the history of seven veteran teams to highlighting their glorious moments. The day before the unveil of the new session of the CBA League, Mr. Li Ning was invited as guest to Talk About, a Tencent Sports programme, during which he talked about the new session of the CBA League with Tencent netizens. In the interview, he encouraged players born in the 1990s to "Play free", and expected that basketball will become more popular in China in the next 2 decades. The China International Trade Fair for Apparel Fabrics and Accessories - Autumn Edition was held in Shanghai (Intertextile Shanghai Apparel Fabrics). As the only domestic sporting goods brand invited to the fair, LI-NING showcased its coffee carbon series and fluorine-free waterproof series sportswear in the environmentally-friendly boutique clothing exhibition area, reflecting the achievements in its environmental protection philosophy and environmentally-friendly and sustainable development. Riding on the development and use of new environmentally-friendly materials, LI-NING brand has set the trend for sustainable design development in the industry through practical environmental protection concepts, making life greener with technology. As the 2014 Shenzhen International Marathon started, more than 15,000 domestic and foreign runners released themselves and run, competing against one another in the city of Shenzhen. Mr. Li Ning, founder of LI-NING brand, and Mr. Li Tie, assistant coach of China's national football team, both appeared on the routing of the Shenzhen International Marathon.